It was an absolutely magnificent morning this past Saturday for Karen and John’s intimate wedding ceremony in the Tranquility Garden at The Safety Harbor Resort and Spa. Karen was escorted by her father down the aisle to join John in front of the fountain. There, in front of their family and friends, the couple shared their vows, exchanged rings, and were pronounced husband and wife by Rev. Rick Lackore of Sensational Ceremonies, LLC . DJ Jeff Tarquinto with Grant Hemond and Associates, Inc. provided the ceremony music and sound; floral and décor was provided by Jana Stall with Event in Bloom; and venue coordination by Maria Savakis and her staff at The Safety Harbor Resort. 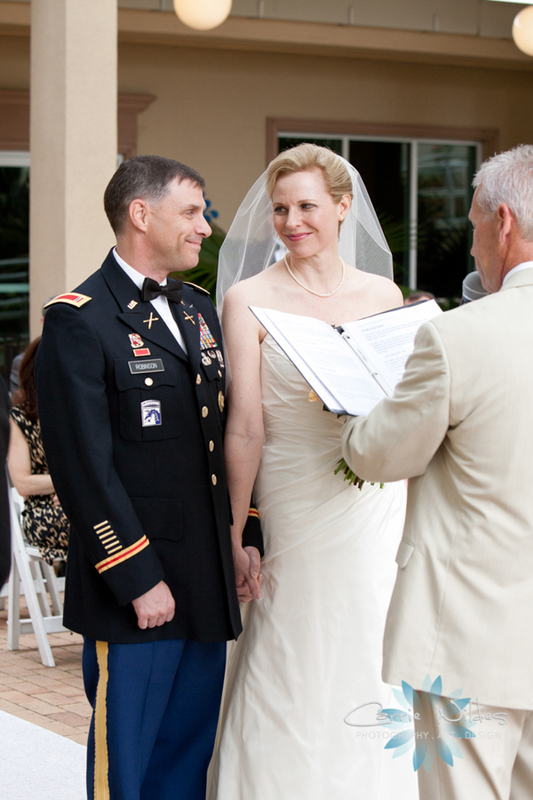 In this picture, wedding photographers Linda and Candice with Carrie Wildes Photography captured the love and excitement on John and Karen’s faces during the ceremony. Congratulations to the new Mr. and Mrs. John Robinson!